It seems like ages ago but it was only last Friday 29th May that I gave my talk at Droushia Heights hotel about the making and publishing of Androula’s Kitchen – Cyprus on a Plate.. To say I was nervous would be an understatement but in fact I was very happy with the presentation once it was over and felt a great relief that it was no longer hanging over me. Like all these things it may seem very simple, the talk only lasted 45 minutes but it took several hours of preparation. There were 475 photos being played on the screen as I delivered my five and half thousand word talk, thereabouts. Another experience under my belt. We had another holiday here in Cyprus this last weekend as well, it was Kataklysmos. Now this has several connections. Like many religious festivals it is tacked onto an existing celebration that dates way back in the mists of time. In the Orthodox calendar it marks 50 days after Easter as well as marking the time of the Great Food in the Bible. So this day is celebrated by all things water related; going to the beach and possibly taking your picnic,swimming or generally playing games with water and this includes for children of course, water pistols. 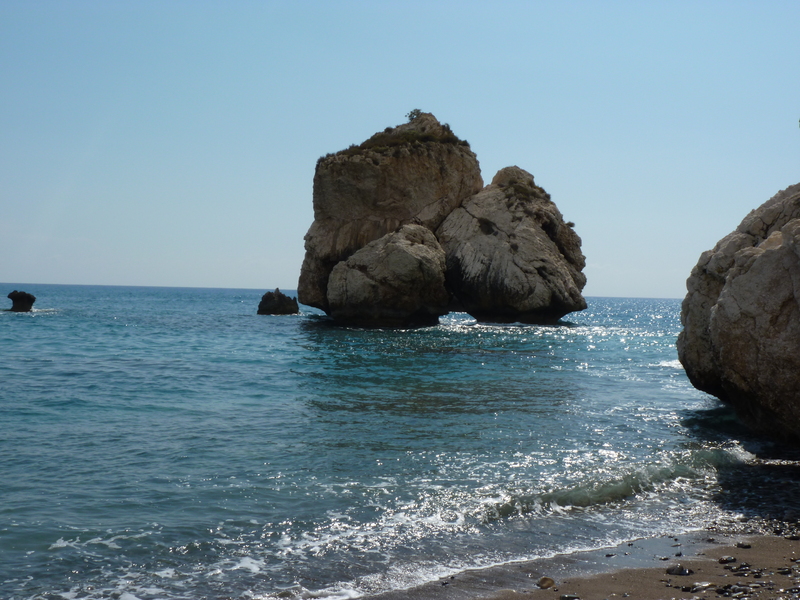 But this festival also relates way back to the celebration of Venus who it was said rose from the foam at Petra Tou Romiou near Limassol, the worship of Aphrodite on Cyprus was a major cult and was an important centre with many large temples dedicated to her. Whatever the origins everyone embraces the holiday and it certainly was a very busy time around the area where I am staying which is close to the sea and saw a large influx of families and people taking advantage of the long weekend. I myself enjoyed a very relaxing time with family and of course this involved a lot of eating as with all holidays here but definitely no water pistols!!! This week I am doing an intensive photography course with Andrea Christofi a professional photographer who lives close by. We are covering all the basics of photography taking me back to the days when I used an analogue camera, we are learning how to get the most out of our digital cameras using many of the same techniques plus the advantages of a digital camera. The digital camera makes it very easy to be lazy and just use the auto setting which generally produces a good photo but you can get so much more out of your camera if you take a bit of trouble to use the many other options available which can help you produce more interesting photos as well as getting some more fun out of photography. Andrea also has a regular photography session with a small group of people every Wednesday when they venture out and about taking photos with a specific theme and then later looking at the pictures they have taken and discussing them. This Wednesday we went to an abandoned village nearby called Theletra. This has some lovely old houses now sadly in ruins except for one or two that have recently been renovated and lived in. The village was abandoned after an earthquake when there was a lot of movement of the surrounding rock face creating a very unstable environment. The residents moved up to the top of the hill where there is now a relatively modern village although the church in the old part has now been restored and is in use. Some of the houses still contain clothing and the whole place has quite an eerie feel to it with some great photo opportunities. I can’t wait to go back though and use some of my new learned techniques and compare the photos. Last week we went down to the beach and played around with using a large aperture and slow shutter speed to get some interesting effects when shaking the camera about. I am now finding out the limitations of my ‘bridge’ camera compared to a proper SLR. The other participants all have much more sophisticated and in there read ‘expensive’ equipment, with extra lenses, tripods and so on so were able to get some extraordinary results that were works of art in themselves. They also were able to produce a double exposure effect which is taking two different photos on one picture so that one image is superimposed onto another, which I didn’t think was possible with digital cameras. In the days of manual or analogue cameras this was all too possible and could cause some interesting results – usually by accident.Tomorrow is our last morning and we are putting it all into practice and playing about with composition which should be fun. It has been a busy and mixed time since my last post. My Uncle died very sadly on Good Friday eve and because it was Easter the funeral didn’t take place until the following Tuesday in Lefkosia. It made the Easter celebrations bitter sweet but in a strange way very apt as it’s a time of death and rebirth. Nearly all the family were at the funeral some relatives I hadn’t seen for many years. There is a tradition of inviting the mourners to take some bread, olives, cheese and wine at the cemetery. There is a special area set aside for the relatives to cater for this in the cemetery where my Uncle was buried but my Father was buried in a small village cemetery and we had to make do as best we could. Also food is provided for those mourners who wish to go back to the house. When my Father died he was buried the next day which is the custom in Cyprus, being a hot country there is sense in expediency. We went to my Dad’s garden to collect flowers and leaves from his bushes to put in the coffin with him which I thought was a very nice idea, much more personal than buying them and he did love gardening. I stayed with a cousin in Lefkosia for a few days and took the opportunity to visit a shop called Faneromeni 70 near Agia Faneromeni church in the centre. A friend had told me about this shop which features solely works by Cypriot artists or artists connected to Cyprus in some way. It is a non profit organisation run by a group of professionals among them anthropologists and geologists, and the money from the sales goes to help the unemployed. A fascinating shop full of quirky things.The shop is surrounded by cafes and as the sun was out and the weather warming up these cafes were full of young people as there are also several small colleges and universities close by. At night I can imagine that this area is very popular as a meeting place for young people to sit and chat over coffee. I went straight from Lefkosia to visit my cousin Androula and spend some time with her in Tries Elies. People come here to walk, rest, enjoy the countryside as it is so tranquil, surrounded as it is by a variety of blossoming trees and at this time of year wild flowers, some very rare, with a river running through by the footpaths and trails all year round. Being such a tiny village in the Troodos mountains you would imagine that there is not a lot going on here. I have to tell you that the few days I spent here were some of the busiest so far in my stay, with people from many different parts of Europe crossing my path. On arrival an old friend had arrived for lunch with her partner from Greece. Then some guests arrived the following evening from Switzerland. On the Monday a Frenchman stopped by to meet the Swiss couple. Next door to Androula now live three young people, an Hungarian, a Belgian and a half Cypriot, half Irish young man; more of these and an exciting eco venture in another blog. On past visits I have met a Japanese couple, British, Russian, Turkish and American. All with interesting stories to tell. The Frenchman’s name is Dominique Micheletto he is a master beekeeper, he has many hives all over Cyprus and spends his time tending to them and giving talks on bees and honey, which was why the Swiss couple had come to Cyprus to meet him and learn about the bees. He won two gold medals in the Apimondia International Federation of Beekeeper’s competition in September 2009. I had wanted to meet him after reading about him in the book ‘Cyprus – a culinary journey’ and here he was without any effort on my part. The conversation between us all was in French, Greek and English, Dominique can speak all three fluently. During my stay with Androula we also visited a friend who lives close by in Pedhoulas and she and her husband are from Israel so yet another nationality to add to the mix. On my way back from the mountains I visited the very picturesque Lofou village on the way down to Limassol. This village must have once been quite a large and wealthy one, as there are many good size stone houses and the streets well ordered, many now deserted but being restored. All on a hilly slope, with little streets branching off it is a lovely place to explore with great views of surrounding countryside all around. Ancient Amathus was my next stop, the archaeological site spreads over an extensive area. Amathus is one of the most significant ancient city kingdoms which dates back to1100 BC. Similar to Kouklia this site saw the important cult of Aphrodite – Astarte flourish here. This is why Cyprus is known as the island of Love. Since I’ve been back in Prodromi I, along with many of her friends, went to cheer on my friend Elena Savvides of Orexi Cyprus fame, last night as she took on the daunting task of giving an hour long talk at Droushia Heights hotel. She was amazing and the story she told was not only full of interesting detail and mouthwatering photos of some of the food she has cooked for events and suppers but was exceptionally touching and had a few of her friends a little bit choked, with emotion I might add not the food. Elena had also prepared some delicious bits to eat so it was a very satisfying evening on all levels. It’s been a busy time since I last posted. The weather has been gradually getting warmer, today it was 23 degrees in Paphos so several layers of clothing have been shed in the daytime and thinner layers are called for. Today being International Women’s Day there was an event my friend Elena of Orexi was catering for in a Anasa community Wellness centre in Paphos run by Annelie Roux. I went along to lend a hand and took some books just in case. There was a whole programme of taster sessions of about 20 minutes duration including self-defence and Chi Gong, It was a beautiful day. On Thursday my cousin Androula came down from Treis Elies to walk the Aphrodite Trail and we set off at an easy pace stopping to admire the wild flowers, cyclamen were everywhere and as we climbed ever higher like the proverbial goats ,the panoramic scenery became more and more breath-taking and the orchids became larger, dotted about with yellow anemones, the smell of the gorse was heady. The combination of the exercise, scenery. and the fresh scented air was both invigorating and relaxing. We chose to climb up the steepest side and it seemed we would never reach the top, once the plateau was reached the scenery changed again with a lush covering on the ground and a different species of tree intermingled with the grey skeletons of dead bushes either ravaged by the harsh winter or just past their natural life span. Whereas the ascent was on a gravelly soil, the descent was on stoney ground, many in large slabs with almost natural steps taking you down in a gentler slope. Areas where many travellers had passed were dotted with their creations of stones stacked in natural sculptures. We passed the goats feasting on the fresh lush vegetation, hearing the tinkling of their bells before coming into view looking very sleek and proud. This walk takes about three hours if you are sturdy walkers but as we stopped for various breaks and admired the scenery we took nearer four hours. It is one of the many trails you can take in this area some less strenuous and shorter, some longer. On the Friday I did another foray into the wild, this time more of an amble along the country roads of Droushia with Elena’s foraging group. I had been looking forward to this for a long time. Elena supplied a very tasty breakfast before we set off in search of wild food to cook for lunch. The most prized food being wild asparagus which we found very difficult to find as the harsh weather had sadly brought this delicate vegetable to an early end but some of the group were successful in claiming the odd shoot. We gathered the succulent centres of wild artichoke, mallow leaves, mustard flowers, nettles, vetch and wild pea shoots along with a few other wild leaves. These Elena turned into a wonderful risotto with gorgonzola cheese and garlic, the mallow leaves were cooked with onion dressed with lemon and had a wonderful fresh flavour while the artichoke stalks were cooked with fresh louvi (a black eye bean that is a Cypriot favourite and eaten often) and dressed with oil and salt. The rare asparagus was cooked with scrambled egg. The mustard flowers and various shoots and leaves were made into a delicious salad. We sat in the garden under the mish mish tree and ate our flavoursome lunch washed down with a glass of chilled white wine. A truly relaxing and inspiring morning with good company. Next week sees a complete contrast as I’m off to walk the mean streets of Nicosia. A visit to my optician this week sent me rushing to view a video on You Tube, not just one but a series of eight. The reason – he was reminiscing about an old TV series from 1979 that was set on Cyprus called “The Aphrodite Inheritance”. I think the real reason he remembered it so well was because the leading lady cast for the role of Aphrodite (Eleni) was Alexandra Bastedo a real beauty ,as you would expect no less for her to be, cast to play Venus herself. Alexander Bastedo lived locally and was married to Patrick Garland who for many years was the Director of The Chichester Festival Theatre which is local to where I live. My optician whetted my appetite for viewing this old serial by describing it as a tale of mystery and intrigue involving treasure, myth and history all set on Cyprus. The quality of the You Tube offering was very poor sadly a bit like viewing through a glass of water but the story certainly was entertaining. It seemed to have been shot entirely on location and gave an authentic feel using not only scenes incorporating local colour like tavernas, coffee shops, historical sites and at one point a real festival running through the streets but many of the actors were Cypriot as well as many local extras. 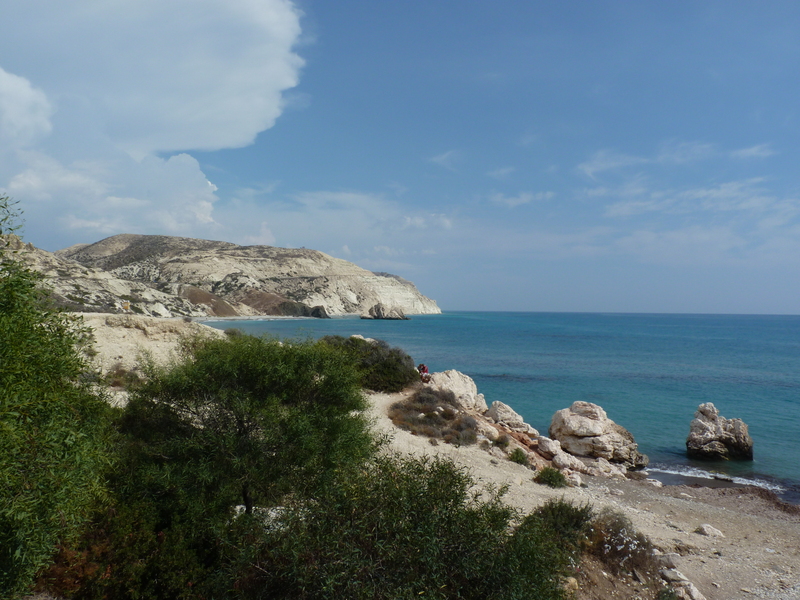 Where it was disappointing was the serious under use of one of Cyprus’ main assets – the scenery. The last episode had some good scenes in the Tombs of the Kings and the amphitheatre at Curium as well as the shores around Petra to Romiou but many early scenes which, if it was shot today I feel sure would include some fabulous panoramic shots, just seemed to show a lot of very scrubby, dusty landscape by the side of the roads. I’m sure they shot it late in the year when everything looked parched to extinction. In stark contrast I went to see the film “Mr Turner” this week about the renowned painter William Turner 1775 – 1851, ( Timothy Spall) famous for his impressionistic land and seascapes. In this film the scenery is at its most breathtaking, giving us the vivid beauty of sunsets and scenery showing us the very scenes in all their magnificence, that Turner depicted in his paintings. The technology involved in film making has advanced so much. These days we are so lucky to be able to view films that give us incredibly clear high definition images, particularly when viewing scenery, they make us fee we are there,we can almost smell the fresh air see every blade of grass , smell the ozone as well as feel the spray of the sea. There is a DVD available of the whole “The Aphrodite Inheritance” series and I’m sure that has to be of much better quality, I would certainly hope so anyway. If you want to remain in ignorance of the story as you will be viewing the series yourself, don’t read any further. The storyline revolved around a hidden tomb of Aphrodite being discovered accidentally, containing a hoard of fabulous treasure. The three gods Dionysos, Pan and Aphrodite appear in human form and manipulate the proceedings so that the treasure remains where it has for thousands of years. The baddies get their just desserts and the good are rewarded. Peter McEnery plays the lead male role and Brian Blessed appears as a wonderfully larger than life Dionysos. I recommend it. After visiting the Baths of Aphrodite I wanted to pay a visit to the birthplace of the Goddess of Love . Where the beauteous Venus rose from amongst the surf, legend has it, was at a spot called Petra tou Romiou . 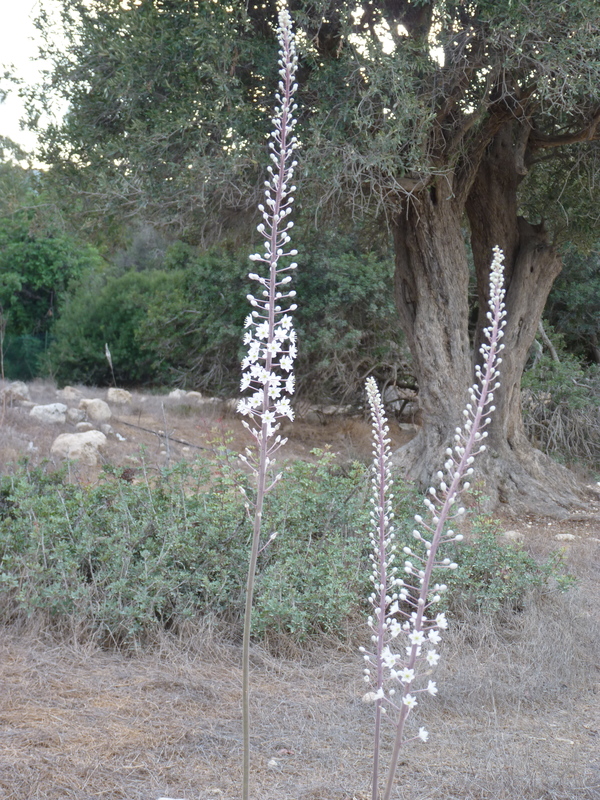 This spot is to be found along the old Paphos to Limassol road, the B6. The coastline is quite spectacular on this stretch of road and I used to enjoy driving along it. There is now a major motorway which will take you all the way from Paphos to Lefkosia and Larnaka if you wish for speed and it has to be said this does reduce the travel time but my, is it tedious and much of the coastal views are lost behind the safety barriers.So as I was to journey from Polis to Larnaka I chose the scenic route and I wasn’t disappointed. You have to have your wits about you though, as the signs are determined to get you onto the A1, the motorway, at every opportunity. But stick with the B6 and you’ll be rewarded with a varied and interesting , if somewhat longer drive. The coastline where the Petra tou Romiou lies is scattered with large rocky outposts and coves there is now a tourist pavilion on the opposite side of the road where you can park and walk through a tunnel which will take you under the road and onto the beach. I was very surprised to see how busy it was, the last time I visited, many years ago, it was almost deserted. Now it was a busy beach with bathers and sightseers alike. 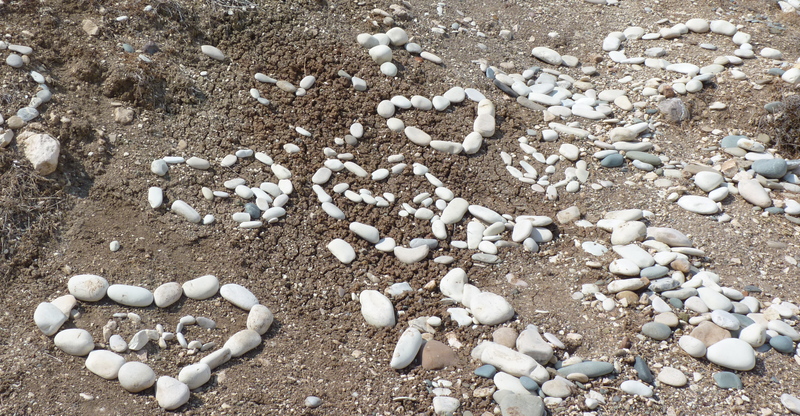 The really touching site, everywhere you looked, was where visitors had left their mark by placing pebbles in the shape of hearts with messages of love. This brought to mind my recent visit to Hambis o’Haractis whose latest works are screen prints on the theme of Petra tou Romiou and the goddess of LOVE with references to these tokens left by all the lovers and possibly would be lovers, who had visited the site. He has worked many variations on the theme and all are delightfully colourful using yellows, pinks, blues and greens. Further along this road you can access Kolossi castle and ancient Kourion as well as driving through the British Sovereign base of Akrotiri. I lost the road completely, unfortunately, when I reached Limassol, it seemed to disappear without a trace and I wound my way around the streets of old Limassol where there were many quite impressive old buildings to distract me, finding my way to the seafront where I was sure I would eventually pick it up again once I had fought my way through the traffic and crowds. But by then time and energy was disappearing fast and I decided to give in and follow the A1. Yesterday late afternoon I made a trip to Aphrodite‘s Baths up on the edge of the Akamas. It has cooled down enough now a pleasant 26 -28 degrees and in the late afternoon there was a pleasant breeze, a perfect time to make a pilgrimage to this beautiful spot. Cyprus is the island of Aphrodite who, legend has it rose out of the sea foam at the rock that is called Petra tou Romiou found between Paphos and Limassol. 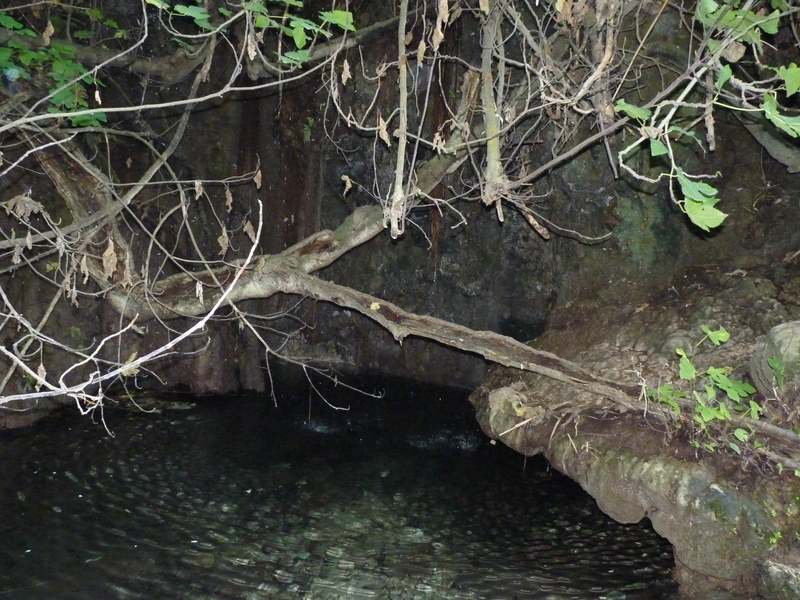 On the edge of the wilderness that is the Akamas there is a cave with a crystal clear water pool that is said to be where she bathed. 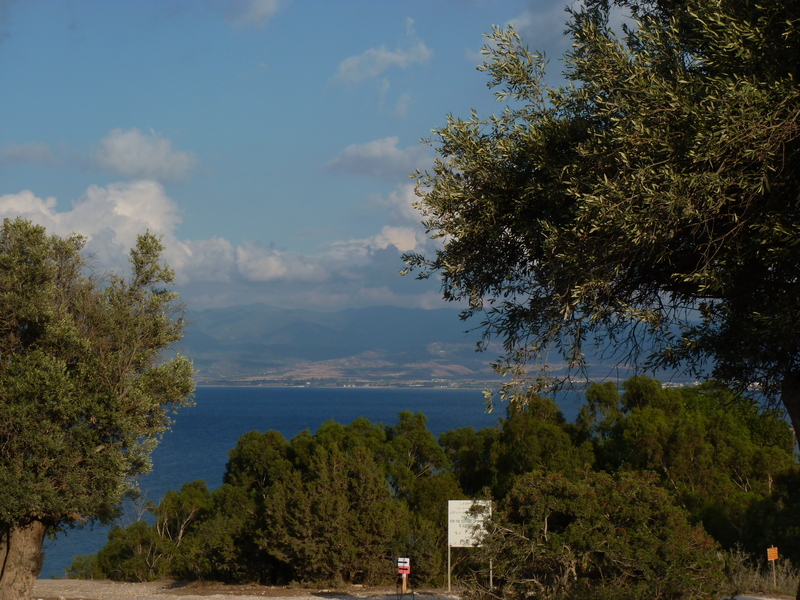 Taking the road from Latchi you wind a round the coastal road with ever-changing views of the coast on your right until you come to the very edge of the Akamas. must add to this heady, fragrant aroma. 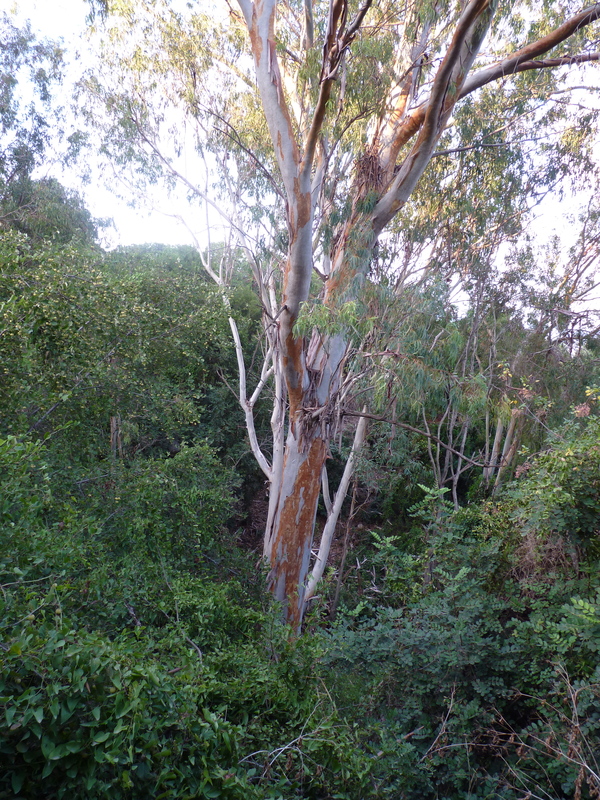 The Eucalyptus is not indigenous however, as it was introduced during the British rule to try to counteract the swampy areas and so reduce the mosquito population. As I made my way down the steps to this shady, cool and tranquil grotto I heard the water trickling down into the pool. The area is completely secluded with olive, fig, eucalyptus and numerous other bushes and trees growing all around and above . The crystal clear water in the pool is very cool I stood my foot in one of the gullies flowing from the pool and felt the tingling effects of this refreshing coolness for quite some time afterwards. Nowadays people are requested not to swim or paddle in the pool but when I first visited this was the norm. Health and safety is everywhere these days. There is close at hand however, a small rivulet running down a rock into a natural stone basin, where you can wash your hands and cool your face. From here there is the start of a nature trail that will take you on the Akamas. 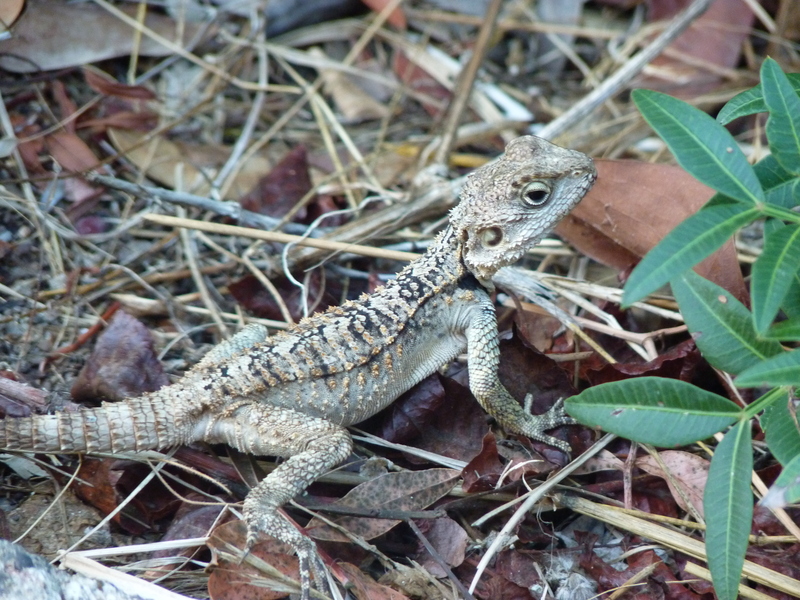 Wandering back up the steps I came across a magnificent gecko who scurried away into the undergrowth before I could snap it but the young one remained quite still for some moments allowing me a shot. I made my way around onto a high area with spectacular views over the coast and lingered for a while at this peaceful spot before making my way back as dusk was beginning to fall. Farewell until next time. At the weekend I went to join in the fun that was Med Fest at West Dean. It was the first time for this event and is a celebration of all that is Mediterranean. There was a lot of food of course and music. 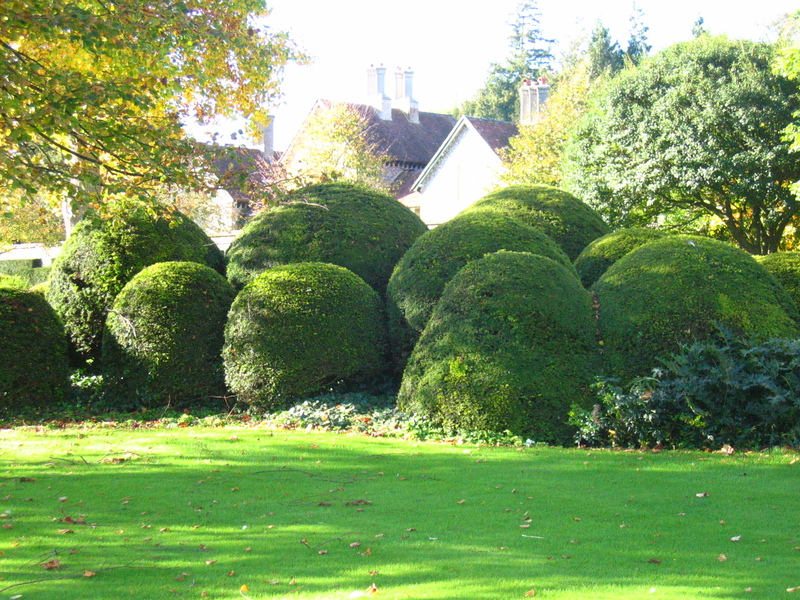 West Dean is very local to me and is shorthand for West Dean College and Gardens. A large Edwardian mansion converted into a college which runs not only foundation courses in restoration and tapestry but many short courses on all manner of arts and crafts in a beautiful setting nestling in the South Downs. Med Fest was held in the grounds and in between the many delightful cookery demonstrations, there was a demonstration on how to make Turkish Delight. Who would have thought? 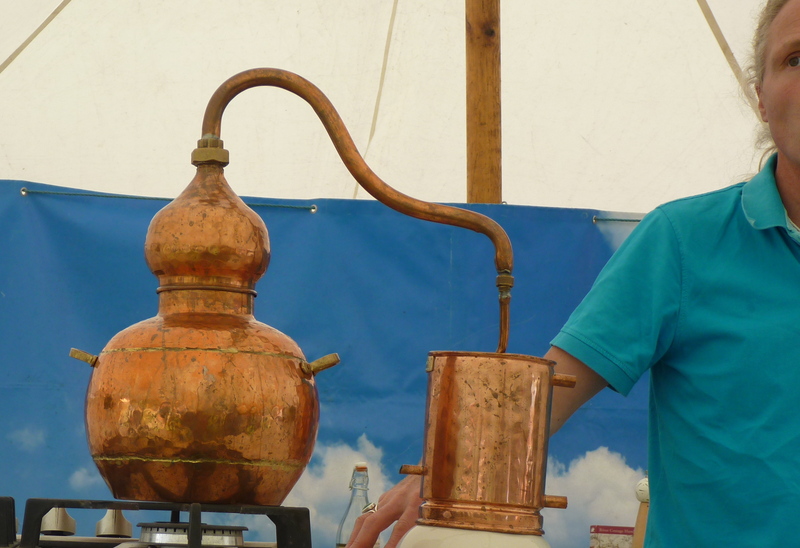 The herbalist Steve Taylor, who gave the demonstration brought along a typical copper distiller which is used throughout homes in the Middle East to extract oils and essences from all manner of herbs and flowers by passing steam through them. So the steam teases out from the rose petals their essence miraculously and carries it through the droplets to end up as rosewater or orange blossom into orange water etc.etc. He then produced some rosewater which was made earlier and gave us all a treat by spraying the cooling & calming liquid amongst the crowd. We all swooned…of course. One of the many Greek myths around the creation of roses, Steve told us, is that Aphrodite or Venus, wept over the wounds her lover Adonis suffered and her tears mingled with his blood and created the red rose. This is where the connection between red roses and love stems, if you’ll excuse the pun. The best roses grow in high altitudes he told us, and the mountainous regions of Troodos area in Cyprus for example do indeed, yield very good roses. What has all this to do with Turkish Delight you might ask? well this little morsel of delight is made up simply by mixing a sugar syrup together with cornflour and water and adding rosewater. The little cubes of this refreshing sweet, which we were offered to us at the end of the demo. known in Cyprus as loukoumia, were the lightest and most delicious morsels I have ever tasted. These can often be offered at the end of a meal with coffee, the stickiness lines the oesophagus and the rosewater calms and soothes to aid digestion. Now, when I get that sugar thermometer, I’m going to try making some of my own delight right here in my English kitchen.